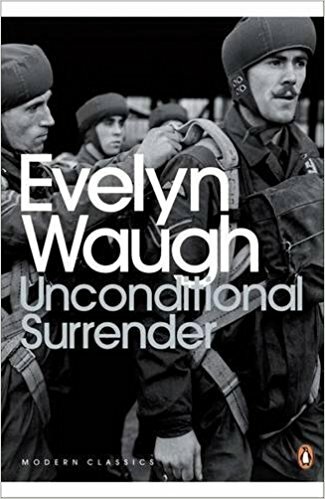 Unconditional Surrender (1961 is the third and final volume in Evelyn Waugh’s trilogy Sword of Honour following Men at Arms and Officers and Gentlemen. 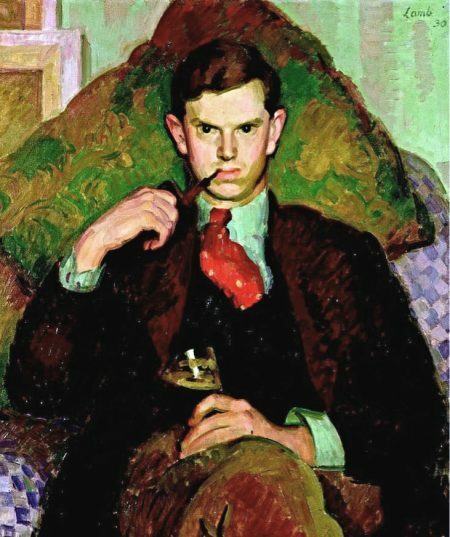 The events of the novel are very loosely based on Evelyn Waugh’s own experiences of his Second World War service between 1939 and 1945. For a detailed examination of the parallels and constructive differences, see the excellent introduction and explanatory notes to the Penguin edition of Sword of Honour edited by Angus Calder. The final volume of the trilogy continues the main concerns of its two predecessors – the absurd bureaucracy and inefficiency of military organisation, and Guy Crouchback’s search for an honourable existence in a chivalric tradition which is collapsing all around him. The contradictions of life in the armed services are all too obvious. There is snobbishness and petty discipline throughout the organisation, plus ridiculous distinctions in levels of superiority. Personnel are promoted for no reason other than administrative convenience, then just as arbitrarily demoted. Supplies fail to arrive, then are delivered when there is no longer any need for them. Orders are issued, then cancelled with no explanation. Troops are put on alert for attacks which do not take place. Key roles are allocated to personnel with no appropriate skills or experience. This is not merely Evelyn Waugh expressing some form of revenge criticism for the discomforts he may have suffered during his own military experience. Rather, he sees the whole officer class as blinded by its own ignorance and privilege. It is a patrician view of regret that some imaginary tradition of honourable conduct is coming to an end. And it is being replaced by a shabby and lacklustre modernity. The case of Guy Crouchback as an individual is very closely linked to that of official disarray and inefficiency in the officer class. Guy is trying to uphold the values and behaviours of an old chivalric tradition which is in terminal decline. In fact he is the last male member of the Crouchback family. His elder brother has been killed in the first world war (on his first day in combat) and his other brother has gone mad and died. Guy has been married (to Virginia) but is now divorced and has no children. To emphasise the fact that he is the last chance for producing a hereditary heir to the Broome estate, his father dies during the course of Unconditional Surrender and Guy is described by a friend as fin de ligne. All Guy’s attempts at making a positive contribution to the war effort come to nought – largely because of military incompetence, but also as a result of his ‘bad luck’ and outdated notions of honourable behaviour. To emphasise Guy’s impotence, Waugh produces his final satirical piece of irony. Guy re-marries the feckless, selfish, and louche Virginia – a woman whom he desires but does not really love. And she is pregnant with someone else’s child. In fact Guy re-marries her because she is pregnant: he takes on the unborn child as a chivalrous gesture to help a woman in distress. More than that, the ‘someone else’ is Trimmer McTavish, the lower-class opportunist and womaniser who is the moral epitome of everything Guy disdains and tries to rise above. So the Crouchback line and tradition appears to be continued as far as the public is concerned, but Guy knows that it is not. At the end of the novel, following the death of Virginia in a doodle bug raid, Guy gets married again to a younger woman – but they have no natural children between them. And to further underscore this theme of decline in the upper-class and its traditions, there is a similar ‘end of the line’ conclusion in the other branch of the family. Guy’s sister Angela has a son, Tony, who joins the army at the same time as Guy. Tony is taken prisoner during the war, but at its end he takes up holy orders and enters a monastery. There is to be no continuity on that side of the Crouchback family either. 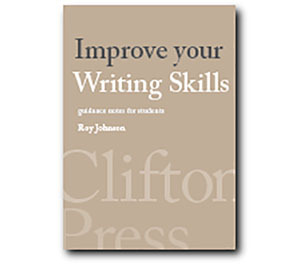 The novel ends with a series of misunderstandings and ironic reversals that accurately mirror those of its beginning. Guy befriends and tries to help a group of Jews who are being treated as ‘displaced persons’. As a parting gesture he gives one family his remaining rations and a pile of old American magazines. The family are arrested by partisans and tried as spies possessing ‘counter-revolutionary propaganda’. The implication is that they are executed. Guy’s act of good will brings about the death of people he has tried to help – just as his friendly bottle of whisky killed Apthorpe. Ludovic the strange author of pensees is revealed as someone mentally unstable, a murderer, and a Communist. He also rather surprisingly turns out to be the best-selling author of The Death Wish which seems to be a bad romantic novel. His royalty proceeds are spent buying Guy’s family home in Italy. Sir Ralph Brompton is almost like a character from the Cambridge Spy Ring: he co-ordinates the activities of the other communists and their sympathisers whilst appearing to be an unimpeachable member of English society. After his escape to India to evade a court matial for cowardice in deserting his troops in Crete, Ivor Claire joins the Chindits in Burma and is awarded a Distinguished Service Order. In other words, treachery and bungling incompetence are rewarded, whilst honourable, chivalrous behaviour results in ironic tragedy. It is not surprising that Guy Crouchback finally retreats into cultivating his garden. Eight weeks after leaving Alexandria Guy arrives back in London. Trimmer is touring northern England as a war hero accompanied by Virginia. No proper job can be found for Guy, and he is too old for active service. He is given an ill-defined job as a liaison officer, with very little to do. Ludovic has had his pensees accepted for publication by a left-wing magazine. Virginia is divorced by her third husband Mr Troy. She is tired of Trimmer, pregnant with his child, and broke. When Ludovic meets Guy at a smart party in Chelsea, he is frightened that Guy will reveal the truth about what happened during the retreat from Crete. There is an implication that he was responsible for the deaths of Horn and the boat skipper. Old Mr Crouchback dies, leaving Guy the last in his family’s line, but inheriting half of the money. Guy wonders if some task or duty will arise to assuage his sense of ennui and uselessness. Virginia tries to locate an abortionist, without success. Ludovic is in charge of parachute training, to which Guy is sent prior to a posting in Italy. In fear of being recognised, Ludovic hides from everyone. Guy injures his knee on the practice jump and is hospitalised. Ludovic nevertheless recommends him for active service – in order to get rid of him. Guy goes to stay with his bachelor uncle Peregrine. He is visited by Virginia, who flirts with Peregrine and wants to re-marry Guy. She tells him about her pregnancy, and he marries her because of it, out of a sense of chivalry and self-sacrifice. Guy arrives in Bari in southern Italy and is briefed for a posting in Yugoslavia. He is put in charge of a supply airfield in Croatia and becomes caught up in problems dealing with a group of Jews who are being treated as displaced persons. In London Virginia converts to Catholicism, has her baby, and then ignores it. Ludovic completes a long romantic novel. Guy is joined by his new commander Frank de Souza, and he learns of the death of Virginia and Peregrine in a flying bomb attack. A bogus military operation is mounted for the sake of visiting dignitaries, including Ritchie-Hook who returns to the story. The aeroplane bringing them from Italy crashes on arrival, killing several of the crew. The staged attack on an enemy post is badly organised and executed, and Ritchie-Hook (acting alone) is killed. Guy’s attempt to save a group of Jews fails, and he is recalled to Italy. He learns later that their leaders have been betrayed by information supplied by Communists from within his own ranks. In 1951 after the war Guy marries the daughter of the woman who has raised Trimmer’s son, and he becomes a farmer in Somerset. Ludovic buys Guy’s family home in Italy on the strength of his royalties.